Raisins and Almonds by Kerry Greenwood, a Mysterious Review. 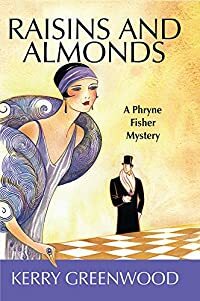 Review: Melbourne socialite Phyrne Fisher encounters the mystery of alchemy and the reality of Middle East politics in Raisins and Almonds, the ninth mystery in this consistently enjoyable series by Kerry Greenwood. The title is taken from a Yiddish lullaby of the same name. A young Jewish scholar has dropped dead, murdered in the bookshop of Sylvia Lee. The police arrest the most unlikely suspect for the crime, the bookshop owner Sylvia Lee, and seem content with their decision. Miss Lee's landlord, Benjamin Abrahams, who just happens to be the father of Phyrne's latest lover Simon, suspects someone else may have committed the crime and hires Phyrne to find the real killer. There is little mystery in Raisins and Almonds. Phyrne knows very early in the book how the scholar was murdered (or at least what was involved in committing the murder), and she probably knows who (as does the reader) as well, but not the why. Her investigation takes her into a world of which she is unfamiliar and, for the most part, in which she is unwelcome. For a series that is generally light and amusing, this book is easily one of the darkest and most somber. Greenwood is known for adding a little extra mystery for the astute reader at the beginning of each chapter of each book in this series, and part of the fun in Raisins and Almonds is interpretting these mini-mysteries. Anyone with a basic chemistry background will recognize the formulas given at the start of the first two chapters; what do these chemical compounds have to do with the death of a Jewish scholar in a Melbourne bookstore? Many other chapters reference terms of alchemy and the classical elements (water, fire, air, earth). All of these factor into the "why" of the murder but may not explain it entirely. The seemingly omnipresent politics of the Israelis and the Palestinians also play a role here. Is Greenwood trying to equate peace in the Middle East with turning lead into gold under the guise of a murder mystery set in 1920s Australia? Maybe … or maybe this is just a simple story of a young sophisticated woman solving the murder of a young educated man in a bookshop. Acknowledgment: Poisoned Pen Press provided an ARC of Raisins and Almonds for this review.